High up in the Hollywood Hills, David Lynch has an artist’s studio that looks out over the smog-cloaked city below. It’s at the top of his large but distinctly discreet 1960s-built house (everything about the plain stone walls and unkempt yard screams ‘don’t notice me’) that contains a recording studio and screening room, various cell-like halls housing Lynch’s paintings, and, presumably, a bedroom or two somewhere. Getting to the studio involves leaving the main building and walking up tiny stone steps flanked by scrubby Californian palms. Inside the studio, Lynch sits, smiling benignly, in front of a large desk buried under oil paints, papers, books and a piece of wood with the words ‘I love you’ etched in a childish scrawl. 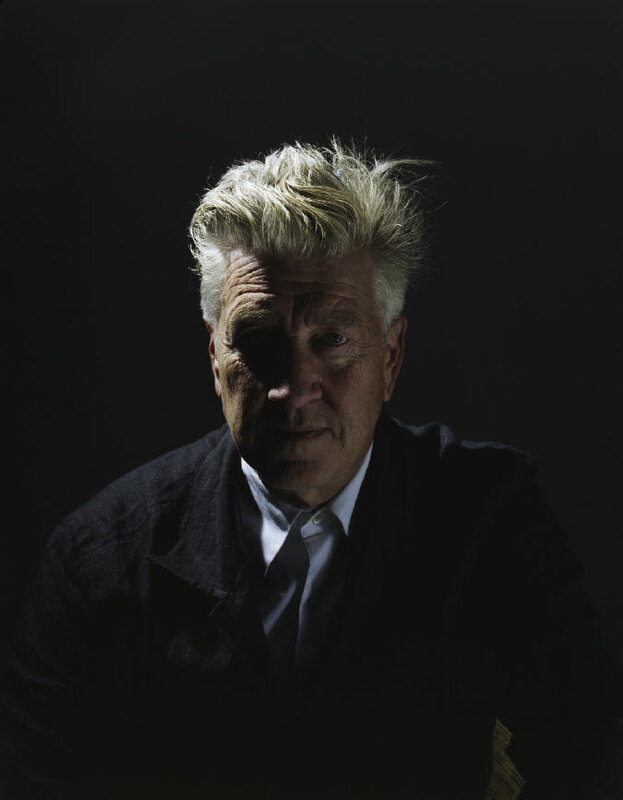 Lynch, now 64, is one of the few film directors in the world with his own, iconic look. When we think of Blue Velvet, Mulholland Drive and the world’s first hit surrealist TV series Twin Peaks, all of them concerned with peeling off the twisted layers of life that lie underneath a seemingly calm and ordered surface, we think of the man with the towering quiff and buttoned-up shirt that made them. And David Lynch is perhaps the only film director with an aversion to talking about his own work, but an endless enthusiasm for the guiding principle of his life since 1973: transcendental meditation. ‘The Creation is in the Creator, and the Creator is in the Creation, totally pervading and permeating all,’ is a teaching that lies at the heart of Sikh thought and life, and this symbol depicts the unity of God and creation. This version of the Buddhist Dharmachakra (see above left) appears at the centre of the Indian flag. The impermanent things of life are the 24 spokes of the wheel, representing 24 hours in a day, while the spiritually permanent things, unity and truth, are represented by the centre. The technique, of course, is the ancient mantra-based system brought over to the West by the Maharishi Mahesh Yogi in 1957 and which subsequently attracted such high-profile adherents as the Beatles, Mia Farrow, Jerry Seinfeld, Sheryl Crow and Def Jam founder Russell Simmons. ‘It takes you to the field of unity, first time, every time,’ Lynch claims of transcendental meditation. ‘And when a human being really and truly experiences that...’ he makes the sound and gesture of a muted explosion. This is where Lynch’s guest spot at Wallpaper* comes in. Initially sceptical at the proposition of adding magazine editor to a CV that includes film director, painter, musician, worldwide lecturer on transcendental meditation and coffee salesman (he’s got his own eponymous brand), Lynch came round to the idea of using the magazine as a canvas for a series of paintings that underpin what he considers to be the great goal of all human life: unity. In the past, Lynch has acknowledged the influence of such psychologically multi-layered artists as Francis Bacon, Jackson Pollock and Edward Hopper. For this project, he is aiming to project images of absolute simplicity and spiritual purity. A symbol in the Baha’i faith of the belief that all religions and humanity are united in one God. The lower line represents humanity and the world of creation, the upper line the world of God, and the middle line represents the manifestation of God. The vertical line is the Holy Spirit proceeding from God through revelation to humanity. Imagery of an all-seeing eye can be traced back to Egyptian mythology. It also appears in Buddhism, where Buddha is referred to as the ‘Eye of the World’ and is represented by a triangle known as the Three Jewels. In Medieval and Renaissance European iconography, the Eye was an explicit image of the Christian Trinity, while 17th-century depictions of the Eye sometimes show it surrounded by sunbursts. In 1782, the Eye of Providence was adopted as part of the symbolism on the reverse side of the Great Seal of the United States. This ancient symbol, depicting a serpent or dragon swallowing its own tail and forming a circle, represents the idea of primordial unity. Jungian interpretation sees it as a representation of the undifferentiated, pre-ego state of a baby who believes itself united with the universe. To put this metaphysical statement into manifest form, Lynch summons up from his computer a scientific equation for unity. It’s extremely complex. I can’t begin to pretend to understand it, and I’m not entirely sure Lynch does either, but in essence it gives a mathematical explanation to the higher state of consciousness that Lynch is on a mission to share with the world. It might come as a surprise that the man associated with exposing the dark recesses of the psyche has dedicated his life to the search for spiritual peace. Lynch, who has meditated twice a day, every day, for over three decades, sees no contradiction between making noir masterpieces like Blue Velvet – which starts with the discovery of a severed ear in a field and gets increasingly sinister from then on – and spreading the Maharishi’s message of love. Nara period Japanese scholars believed the Chinese character for ‘Japan’, 倭, was graphically pejorative in denoting 委 (bent down) 亻(people). Around 757AD, Japan officially changed its endonym from Wa 倭 to Wa 和 (harmony, peace), which has the same Japanese pronunciation and – most importantly – is semantically flattering. The notion that Japanese culture is based on Wa 和 (harmony) has become an article of faith among the Japanese. This ideogram for clasped hands is an ancient symbol of unity for the Native American Hopi tribe, who believe the return of the lost white brother of the Hopi, Pahana, will usher in a new age of peace. In the early 16th century, the Hopi believed the coming of the Spanish conquistadors was the return of this lost white prophet. Legend has it that the Hopi chief knew the Spanish leader was not the Pahana when he failed to respond to the nakwach. Instead of clasping the chief’s extended palm, he dropped a gift into it believing he was asking for a present. This West African symbol represents the chain of humanity in life and death, the sharing of one blood. It stands for unity, responsibility and interdependence, and represents the principle of umoja (unity) in the African American celebration of Kwanzaa. This week-long holiday, which has its roots in the black nationalist movement of the 1960s, is dedicated to the seven principles of blackness, umoja being the principle of striving for and maintaining unity in the family, community, nation and race. This symbol represents the union of the male (lingam) and female (yoni) sexual organs. The lingam is the creative power of nature and represents the god Shiva. The yoni is the source of all that exists, the female counterpart without which the male aspect remains impotent. The lingam united with the yoni represents the abstract form of creation. He cites the example of his 1976 breakthrough feature Eraserhead, an impressionistic portrait of a shy young man trapped in a nightmarish industrial town as he faces up to the birth of his bizarrely deformed, screaming child. Lynch’s last film was the supernatural mystery thriller Inland Empire, released in 2006. Since then he has presented a series of short, touchingly direct profiles on everyday Americans called Interview Project, which share the innocence and guileless charm of The Straight Story, Lynch’s 1999 road movie about an elderly man riding a lawnmower from Iowa to Wisconsin to mend his relationship with his sick, estranged brother. He has also been painting, working with wood, and giving lectures on transcendental meditation. Given the evangelical zeal Lynch has for transcendental meditation – he’s never more animated than when describing the remarkable calming effects it has had on violent prisoners and children diagnosed with ADD – it’s tempting to believe that this has taken precedence over movie-making. Lynch refutes this. This West African symbol of affluence, power, abundance, plenty, togetherness and unity symbolises another principle of Kwanzaa (see Nkonsonkonson, above). It represents ujamaa (cooperative economics) and the principle of building and maintaining businesses to profit from them collectively. The cola nut played an important role in the economic life of Africa. A widely used cash crop, it is closely associated with affluence and abundance. This symbol also represents the role of agriculture and trade in bringing peoples together. The astronomical and astrological symbol for the sun, and the ancient Egyptian sign for the sun god Ra in the hieroglyphic writing system, this can also be a stylised representation of an atom of hydrogen, the oldest, simplest and most abundant chemical element in the universe, and one that also makes up most of the mass of the sun. To Christians, it often represents the unity of the Holy Trinity. In Buddhism, it symbolises the Three Jewels of Buddha, Dharma and Sangha. It is often associated with the number three. Pointing upwards, it symbolises fire and male power. Pointing down, it symbolises water, female sexuality, goddess religions and homosexuality. It’s almost time for Wallpaper* to take a taxi back down the hill, to the world of concrete and frantic optimism that is West Hollywood. We know this because Lynch’s assistant has arrived in the studio with a banana on a plate, which appears to be some sort of termination symbol. But there’s still time for Lynch to throw in a surprise admission. If the filmmaking, painting, lecturing on transcendental meditation, reflecting on the development of consciousness, and guest-editing dry up, it’s good to know that David Lynch has a skill to fall back on. Before we say goodbye, he reiterates the one message he wants to get across in his stint as editor more than anything else: that happiness can only come from within, from finding unity. This is a sacred Vedic syllable considered to be the most auspicious mantra and intoned at the beginning and end of most Sanskrit recitations, prayers and texts. It is taken to consist of three distinct sounds – a, u and m – symbolising the three major Hindu deities or the three stages of life: birth, life and death. The Fock space representation equation was named after Soviet physicist Vladimir Fock, who introduced a highly complex algebraic system used in quantum mechanics to describe quantum states with a variable or unknown number of particles. Roughly translated as ‘diagram of ultimate power’, this is the name for the Chinese symbol for the concept of yin and yang, which is used to describe how polar or seemingly contrary forces are interconnected and interdependent in the natural world, and how they give rise to each other in turn. Similar patterns and symbols also form partof Celtic, Etruscan and Roman iconography. This is the eight-spoked Buddhist wheel of Dharma. Based on a chariot wheel, it is a symbol of the Buddha’s teaching of the path to enlightenment and stands for the law and unity of Buddhism.